The first tournament of note this year for the international youth levels took place over the last 10 days. The U17 Elite Round began as 28 European teams vied for the chance to reach this May’s European Championships. 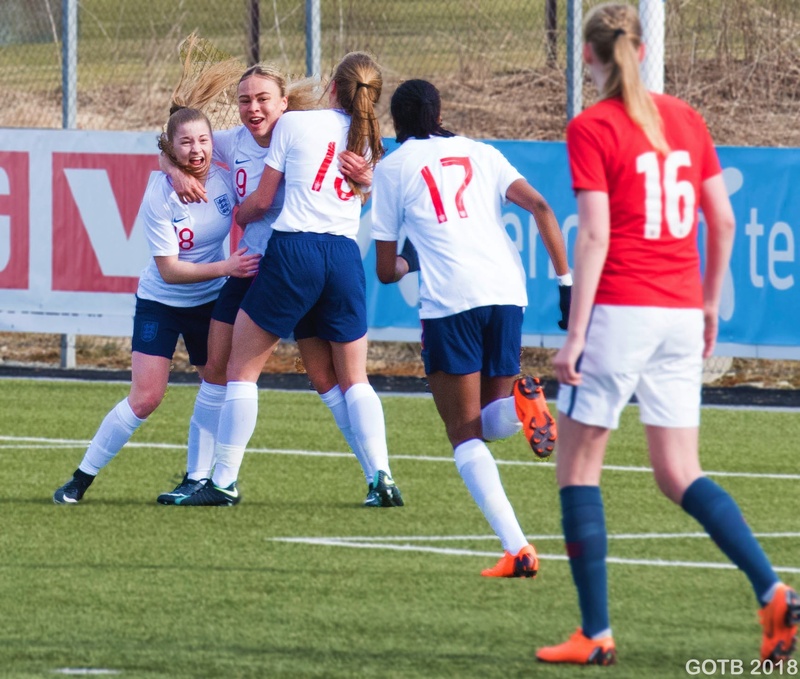 John Griffiths’ England U17 side travelled to Norway with the aim of reaching the Finals for another year. Slovenia, Switzerland and Norway stood in their way, all beatable but providing different tests in their own ways. Griffiths had named a strong squad to take out for the tournament. A few will be familiar to FAWSL fans with six Liverpool players picked as well as Fran Stenson, who made her debut for Birmingham this season, and Jessica Park from Manchester City. But it is Aston Villa’s Ebony Salmon who has been making a name for herself this season in FAWSL 2. With 10 goals in 14 appearances, she currently sits fourth in the league’s goalscoring charts. The Young Lionesses’ opening match came against Slovenia. It was a game that England dominated but could not find a way to make it count. They had 12 attempts to Slovenia’s four but only four of those were on target and they had to make do with sharing the points. Next up for England was Switzerland and a strong second half performance saw them sail through with a 4-0 victory. Liverpool’s Annabel Blanchard gave them the lead in the first half before three goals in four minutes put the result beyond doubt. Hannah Griffin doubled the lead with half an hour left to play before Missy Bo Kearns and Blanchard scored in quick succession to round off the score. We travelled to Klepp for the final game against the hosts. With Norway having won both their games, only a win would do for the Young Lionesses. Anything but would mean they would not be travelling to Lithuania in May. They made a strong start to the game. Kearns’ distribution caused Norway problems in the middle and she came inches away from scoring a thunderbolt after 10 minutes. Norway were equally as potent, however, at the other end and Stenson had to make a brilliant stop to keep the scoreline at 0-0. England came out with renewed vigour in the second half. Whereas the Norwegians visibly appeared to be tiring, England seemed to be filled with a renewed energy. The breakthrough came in spectacular fashion when Park curled a 35-yard effort into the top corner before Salmon’s hard work saw her low cross diverted home off the back of Lotte Fikseth Fossem. Norway rallied but England stayed strong at the back with Stenson making several solid saves. But it was the visitors who came closest to extending their lead when Blanchard was played through. Norwegian keeper, Sara Nilsen Kilen, made herself big, however, forcing the English striker to hesitate and made a big stop to deny her. With about 10 minutes on the clock, Norway were growing into the game. A mistake in the English defence saw Elisabeth Terland played into the box. She played it out to the right and got on the end of the subsequent cross but Stenson made a great stop at full stretch to turn it wide. It was that good a strike! The Manchester City forward hit the ball so sweetly and got the dip absolutely perfect to beat Kilen. England’s best moves came when they found Kearns in the middle of the park. Her ability to spread the ball was a highlight on several occasions, allowing the Young Lionesses to quickly shift the play and find either Paige Bailey Gayle or Park on the flanks. When they find her in space, they can be very potent in attack. John Griffiths will know that his defence needs a bit of tightening up ahead of the Championships. They played themselves into trouble on several occasions and relied at time on some unnecessary last-ditch defending and good goalkeeping to keep the Norwegian attack at bay. The strength of in attack on the field and on the bench was inevitably going to pay off for the English team in the end. With strength in depth, when tired legs began to show, John Griffiths had plenty of options to choose from. His substitutes brought a renewed energy to the game and helped see England over the finish line. A strong finish to the Elite Round saw England reach the main tournament. The U17 European Championships will take place in Lithuania from 9th-21st May. They join Finland, Germany, Italy, Lithuania, Netherlands, Poland and Spain in the draw that will take place on Friday 6th May at 08.00 BST. 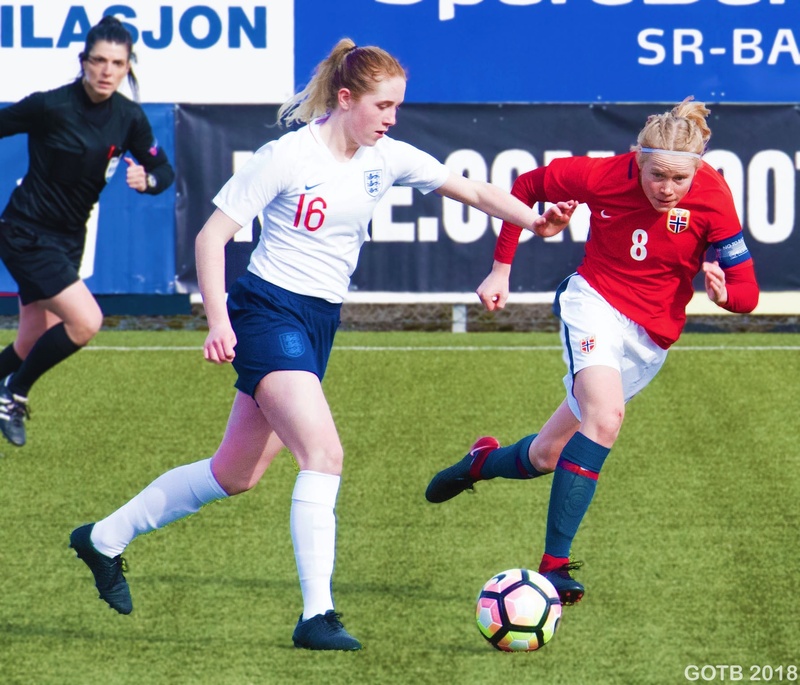 Tagged england, england u17s, football, football blog, International football, lionesses, u17 european championships, women's football, young lionesses. If you have any questions please contact us at girlsontheball10@gmail.com.